Are Gutter Scoops Worth It? Essentially, cleaning your gutter means removing the debris that collects there over the course of time, so should you use a gutter scoop to make the job easier? A lot of people choose to wear gloves and use their hands to do the job. But, there are tools available to help if you do not want to get your hands dirty or worry about puncturing gloves. Gutter scoops are just what they sounds like. It is a short, but relatively deep shovel or spade, usually made of plastic that you use to lift debris out of your gutter. Because it needs to fit in the gutter the utensil must not be wider than your gutter. Gutters range anywhere from two and a half inches to five and a half inches in width so the scoop needs to be slightly smaller than your gutter width to function properly. Make sure you measure before you purchase. These tools will usually start with just a flat plastic bottom and then the sides will get gradually taller as you move towards the handle. Make sure that your gutter scoop can hold a good amount of debris. You do not want to be slowed down by having to scoop very small amounts over and over. You can accomplish your task much fast if you can take larger scoops out each time. 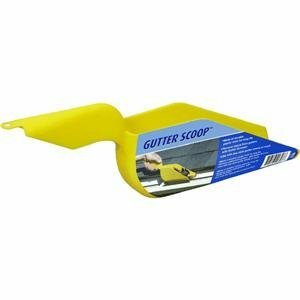 Another way to save time is to find a gutter scoop with a very long handle so that you can reach further down the gutter without having to move your ladder. The most time consuming part of cleaning the gutters is going up and down the ladder to move it. A long handled gutter scoop will allow you to reach a larger area of the gutter without moving. Slim profile works with all gutter styles. Scoop can be used for numerous applications besides just cleaning debris from gutter. It has high sides to help prevent spillage and measurement units inside scoop and handle. Convenient handle notch allows scoop to be hung. You can purchase these tools from a variety of places. The most likely place to find one would be a large home improvement chain store like Home Depot or Lowes. You can also find them at many online retailers or general purpose stores like Target or Wal-mart. You shouldn’t have to pay more than five or six dollars for a serviceable product. Alternatives to buying include using your hands or a garden trowel or making your own. Your hand is the cheapest alternative, but it is slower than using a scoop. Most scoops will be able to hold several handfuls of debris and will make the chore go faster. Garden trowels have the same problem. They are small enough to fit in the gutter, but they do not hold a large volume of debris. Another downside to using a trowel is that they do not have the steep sides to hold the debris in place. Even if you manage to get a large scoop of debris, it will fall off the sides before you can get it to the bucket or garbage bag. Making your own is probably your best alternative. Fabric softeners bottles area good choice because they are thin. You should leave the cap on and turn the bottle on its side. Then cut the bottom off at an angle to make the sloping sides of the scoop. Whatever tool you decide to use, make sure that you make the choice. Cleaning your gutters is extremely important and cannot be avoided. I would recommend using a gutter scoop to make the job go faster. I finally got away from “scooping out” my rain gutters and now I don’t have to use a “ladder” either. I have found a great new tool, on-line, called the Gutter Clutter Buster. It is an attachment tool that fastens right onto the end of my 2-1/2″ wet/dry vac HOSE. It literally vacuums out all gutter debris, wet or dry, and the mess goes directly into my vac canister. The hardest part of the job now is to empty the debris into my compost pile. I never have to climb the ladder again or drag buckets, scoops, gloves, and garbage cans around the house. I’ve cut my cleaning time almost in half while I stay clean and firmly on the ground. And, don’t you know, this tool is made in USA and is exactly as advertised. Very durable, sound, safe, and easy to use. Its now my favorite tool in the garage, when my neighbors aren’t begging to use it. Check out their web page and see if this tool isn’t truly worth more than you’d ever image! Most important you will remain safe by not needing a ladder to clean gutters ever again!